Research has shown that social grants have a great impact on overall levels of household poverty. The child support grant, in particular, has been central to poverty alleviation. Researchers at the University of Stellenbosch have shown that the number of children whose parents reported that their child had gone hungry in the previous year declined from 31% in 2002 to 23% in 2005. Economists at the University of Cape Town have shown that a quarter of those unemployed nationally derive income support exclusively from the grant income of other members of their household. Access to social grants, particularly the child support grant and the old age pension, shift millions of South Africans from the lowest into the lower-middle income deciles. What Ferguson misses is that social grants and their delivery have become enmeshed with systems and logics derived from finance capital. While Ferguson hails social grants as a potential chink in the neoliberal edifice allowing citizens to make redistributive claims on the state, the ways in which social grants are delivered and processed has facilitated the emergence of predatory forms of micro-lending that targets the poor. From its inception the tender was dogged with allegations of corruption. At the 11th hour the tender was changed to include requirements for key biometric security features that only Net 1 could meet. A high court judge ruled that the tender process was invalid but that Net 1 should continue distributing grants as re-issuing the tender would pose a risk to grant holders. Then in 2014 the country’s Constitutional Court ordered SASSA to re-issue the tender after the judge criticized the agency for ‘irregular conduct’. Net 1 still holds the contract until 2017, but has decided not to apply for the new tender, choosing to focus instead on expanding services to “unbanked and under-banked citizens including social grant beneficiaries, but independently and without SASSA’s limitations and constraints.” To this end, Net 1 operates an array of financial entities that specifically target grant holders, including Easy Pay, a company that allows grant holders to access loans, buy airtime and electricity and make store purchases; Moneyline, a company that provides loans to grant recipients; Umoya Manje, a system that allows holders to buy cellphone airtime on credit; and SmartLife Insurance company. It was not just the tender that was mired in scandal. Shortly after Net 1 got the tender, grant holders began reporting illegal deductions from their monthly payments. SASSA has since received thousands of complaints over illegal deductions for airtime, electricity, funeral plans and loan repayments. In April 2016 alone they received more than 23,000 complaints over illegal deductions. In June 2016 SASSA brought criminal charges against Net 1 and Grindrod Bank, alleging that it was not complying with the amended 2004 Social Assistance Act which makes it illegal to deduct funds from social grant holder’s account. This case has been delayed until October, but in the meantime illegal deductions continue to drain the accounts of the country’s poorest citizens. Fieldwork conducted in two townships in Cape Town in May and June 2016 reveal some of the dynamics of how these deductions occur. Social grant holders have the choice to go and withdraw their money from a CPS-run (Cash Paymaster Services) pay point or to withdraw their funds directly from an ATM. In the latter case they are charged transaction fees, so many queue in long lines from early in the morning to receive their grants. Shortly after CPS began distributing loans, stories began to emerge of CPS staff offering social grant holders loans at pay points. We confirmed this in a series of workshops conducted with social grant holders from Philippi and Gugulethu, two townships in Cape Town. Social grant holders were told by CPS staff to take their SASSA cards and ID documents to the offices of Moneyline Financial Services were they would be approved for loans. Others had been pre-approved for loans after they received texts from Moneyline asking for their SASSA and ID numbers. 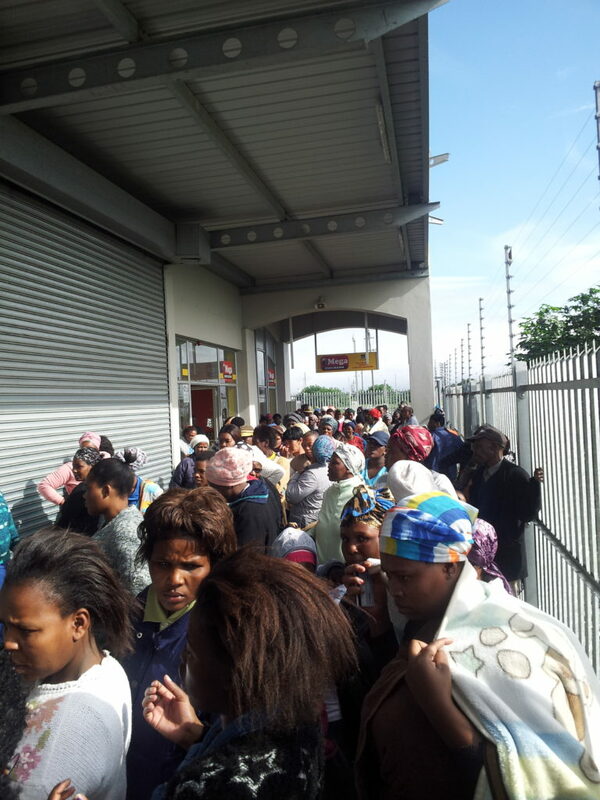 On June 2, 2016 we spoke to people in a hundreds-long line outside the Moneyline offices in Philippi. They were waiting to be approved for short-term loans of anywhere from R410 to R1050 to be paid-off over 3 or 6 months. Technically Moneyline doesn’t charge interest on these loans, just ‘service fees.’ These ‘fees’ are paid back through monthly installments on the principal amount over a six or three-month period. For an unsecured loan of R1050, with a repayment period of six-months, the service fee is R330— a repayment amount of 31%, equivalent to 101% annual interest. On a loan of R410 paid off over three-months the service fee is R100—a repayment amount of 24%, equivalent to 141% annual interest. While Moneyline states they don’t charge interest because their customers are “the poorest of the poor,” high repayment fees often completely drain borrower’s social grant accounts. The justification for high interest rates on micro-loans is that lending to the poor is ‘risky’ because of potential default. Repayment on these loans, however, is guaranteed by borrower’s social grants which are deposited at the beginning of each month. It is illegal for Moneyline to deduct loan repayments directly from social grants, but they have found ways to get around recent amendments to the Social Assistance Act. 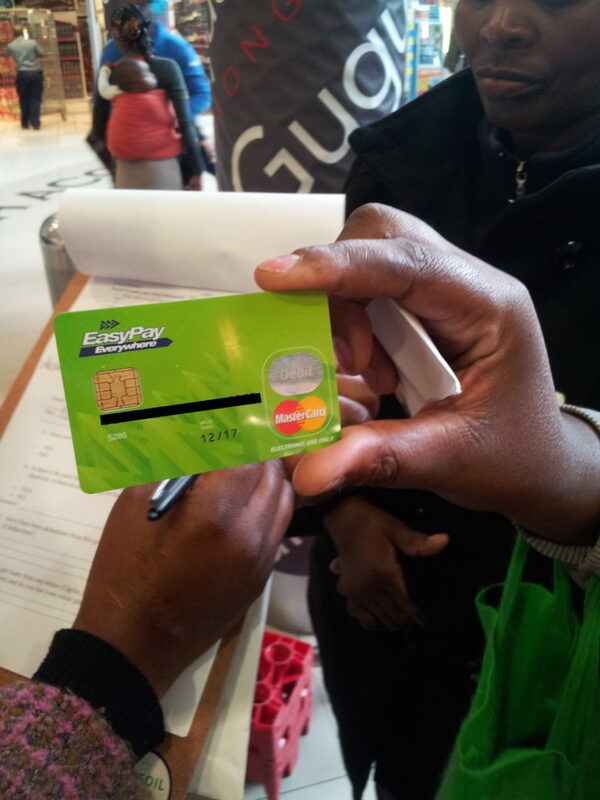 Those we spoke to in the Moneyline queue told us that once they were approved for a loan they were given an EasyPay card, which is a ‘financial switch’ card allowing holders to transfer funds between debit and credit accounts and purchase airtime, electricity and retail goods. In their loan agreement, borrowers give Moneyline permission to transfer funds from their SASSA account to their Easy Pay account in order to service their debt—this is easily done because both accounts are controlled by Grindrod Bank. On transaction statements we were shown loan repayment amounts were deducted in advance of social grants being transferred to Easy Pay accounts. The Easy Pay card is effectively a way for Moneyline to circumvent the amendments to the 2004 Social Assistance Act, that prohibits deductions directly from people’s social grants, and indirectly tap into holder’s grant money. In May 2016 SASSA claimed they had clamped down on illegal deductions through amendments to the 2004 Social Assistance Act, and that only funeral policy payments to registered insurers could be legally deducted in the future. Research we conducted the following month told a different story. We found multiple instances of illegal deductions and little information about how to challenge them. A pensioner told us he had borrowed R1000 from Money Line in November 2015 with a monthly repayment of R220 over 6 months. It was now June, and his pension payout was only R1160 rather than R1500. There was nothing on his transaction statement to indicate where the money had gone. A woman waiting in a queue at a nearby grocery store to collect her grant money showed us that R300 had been deducted for airtime and electricity from her 2 child grants. Unauthorized deductions for cellphone airtime is the most common complaint received by SASSA. Another pensioner showed us that she had R64 deducted from her child grant for an Emerald Life Insurance plan that she had never signed up for, and this had been ongoing for over 6 months. In 2015 Emerald Life Insurance agents in Paarl and Franschoek were arrested and charged after it emerged that they were deducting funds illegally from people’s social grants. These are just some of the stories we collected, others documented by Black Sash in their Hands Off Our Grants campaign have revealed how pensioners have struggled to stop thousands-of- Rands of deductions. Grant holders we spoke to had little idea of who to contact if they encountered illegal deductions and they felt relatively powerless to control the flow of their grant money between their SASSA and Easy Pay cards. As the case of 89-year-old pensioner Sipho Bani reveals, grant holders are bounced from office to office, sometimes over a period of months, to have deductions reversed. Rather than social grants being evidence of a new form of welfarism where citizens claim their rights to a share of national wealth, people encounter social grants as potential consumers or borrowers. People’s engagement on the first of each month is rarely with the state, but with bank tellers, CPS agents, ATMs and grocery store clerks, places where the state is, in effect, absent. In these spaces there is no room to dispute illegal deductions or suggest that credit providers are targeting vulnerable pensioners with low levels of financial literacy. On the one hand social grants can be seen as a new form of social welfare quite different from those forms that arose in Europe in the postwar period—grant holders don’t pay into some national insurance scheme and social grants aren’t merely safety nets for moments of income insecurity, but long-term survival tools in a context of high unemployment. On the other hand, the ways in which this system has been implemented has been profoundly alienating and disempowering. The state has facilitated the entrance of finance capital into systems of social welfare delivery. As a result, those 16.8 million social grant recipients are seen as potential customers by a range of financial institutions. In the same way that international banks entered the world of micro-credit in the 1990s, finance capital in South Africa is looking for ways to cash-in on social grants. It appears that they are succeeding. The growth of micro-lending in South Africa has been underpinned by the rapid expansion of finance capital in the post-apartheid period. As Milford Bateman has noted, post-apartheid policies that were intended as ‘pro-poor,’ such as the expansion of credit to poor borrowers, have given rise to a “venal market driven economic system” that has immensely enriched a few CEOs. Finance has been a critical component perpetuating neoliberalism and since 1994 the role of finance in systems of capital accumulation has expanded rapidly. A major area of growth has been in government tenders secured by various Black Economic Empowerment groups. For example, the R10billion tender secured by Net 1 was conditional on them signing a BEE deal. Just days after Net 1 got the tender it announced that it had finalized a major new BEE deal worth R264million with Mosomo Investment Holdings. Mosomo is headed by Brian Mosehla, who was formerly head of finance at the Mvelaphanda group established by businessman and politician Tokyo Sexwale. Mosomo Investment and Sexwale’s Mvelaphanda group had previously worked together to secure a massive Coal of Africa deal. A 2012 Mail and Guardian story pointed out that if Sexwale had a financial interest in Mosomo investments, this would be a major conflict of interest, because when he was Human Settlements minister his director general Thabane Zulu was a member of the SASSA adjudication committee that awarded Net 1 the tender. At the same time as the state has expanded social welfare to the poorest South Africans it has facilitated the expansion of a predatory form of finance targeting those same people. If, as Ferguson would have it, social grants provide a new modality of distribution which can prefigure a more radical redistributive politics, then we must pay attention to the actual mechanics of distribution and how grant holders themselves use and understand social grants. The number of people receiving social grants has skyrocketed, at the same time increases in social grant spending have not kept pace with high levels of food inflation. For example, this year the child grant increased by 6%, but in June food inflation was 10.8% and has averaged 6.5% from 2009 until 2016. Add to this increasing levels of unemployment, layoffs in mining and manufacturing sectors, and projected economic growth rates of less than 1%, and it seems unlikely that social grants can stave off a deep crisis of social reproduction in millions of households. As a recent Oxfam South Africa report highlights, households experience high levels of food insecurity in the last weeks of each month when wages and social grants have been exhausted. Those queuing for loans told us that the amount they received from the government was never enough to meet monthly household expenses, so they had little option to get loans from places like Moneyline. These institutions were seen as preferable to the informal system of township loans or mashonisas, who are known for sky-high interest rates and the threat of violence for defaulting on payments. None of this is to suggest that social grants aren’t necessary or that their expansion isn’t important. But, as Ferguson admits, they “partake in the neoliberal spirit of the age.” The distribution of South Africa’s social grants highlights the ways in which neoliberal logics can undermine redistributive projects, and in the process blur boundaries between state and market disempowering citizens in the process. Social grants have also been, as the election-rally comments by the ANC’s Secretary General indicate, an effective way for the ANC to maintain its hegemony among the poor, particularly in rural areas where social grants are often the only source of household income. In this sense social grants are reminiscent of the broader politics of service delivery across the country. The expansion of services to the poor has been marshalled by the ANC as evidence of its pro-poor developmental policies, while many of these projects have been severely undermined by logics of cost-recovery, privatization and outsourcing that have led to anger and discontent among the poor and the enrichment of old and new elites. Christopher Webb is a PhD Candidate in Human Geography at the University of Toronto and a Research Associate at the International Labour Research and Information Group (ILRIG) in Cape Town. This research has been carried out in collaboration with Nandi Vanqa-Mgijima, Research and Education Officer at ILRIG. Excellent article covering a hugely important topic – how the new digital technologies are going to exploit rather than empower the poor. Fascinating and insightful article. Very depressing as it highlights the global problem of exploitation of the poor in society by private enterprises that have the backing of corrupt governments.